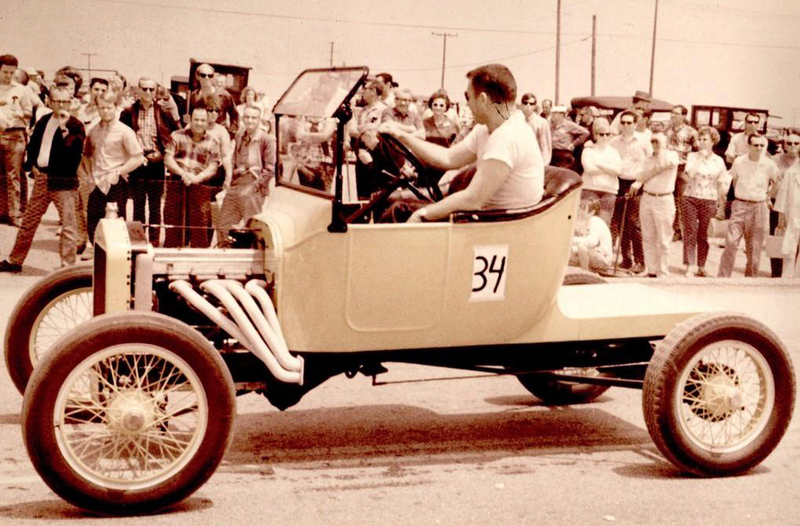 Just A Car Guy: the history of the Rajo head, and Ellis Gray's involvement, thanks to Steve, his son! the history of the Rajo head, and Ellis Gray's involvement, thanks to Steve, his son! 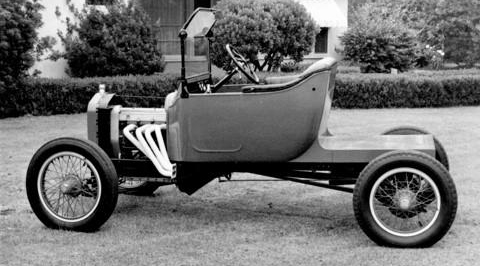 I was raised around my Dad, Ellis Gray’s world of restoration and modification of Ford’s illustrious Model Ts during the 50s thru 70s. 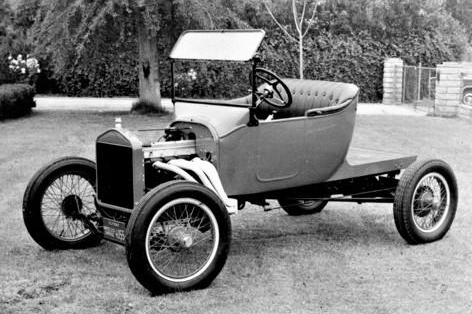 The first car to receive the complete restoration works was a 1918 T Touring, the “Bath Tub” as it was known, back in the early 60s. (Pic 1-3) Taken around 1967-68, a variety of different carburetors (SU, Weber, Etc. ), intake manifolds and ignition distributors were used over the years. Since the Rajo head is set up for dual ignition, there were some unique ideas used! All of the aluminum cam and timing chain housings, covers, gear boxes, pressure and scavenging oil pumps, and pan cover were all designed, drawn out and machined from Aluminum billet. 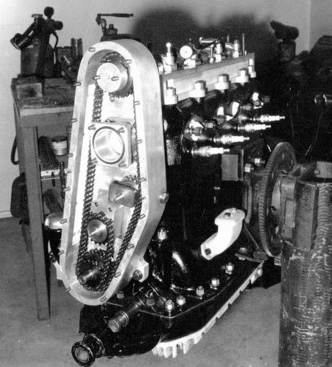 Internally, the 4 bolt con rods were machined from billet, the crank was/is a modified model B (or C?) “Beaver Tail” with the rear main heated, pressed shorter in a special built press and remachined and reground to fit the T block. I think there’s something like 5/8” difference in length. The block was plumbed for oil pressure to the mains and the crank rifle drilled for oil pressure. Pistons, I believe were Jahns racing and the cam was ground by Harmon and Collins. (Pics 4 and 5) Taken in around late 1968 early 1969 by Bruce McCalley of SoCal Model T Club fame. This was probably just prior to the cars first run at the Long Beach Model T Hill climb in May ‘69. Open headers were run during the first year which Ellis Gray, the designer/builder, regrettably took home the “Hard Luck” trophy for the day due to the Rajo head suffering a failure of a large piece of combustion chamber being blown out into the heads’ water jacket in number 3 hole. 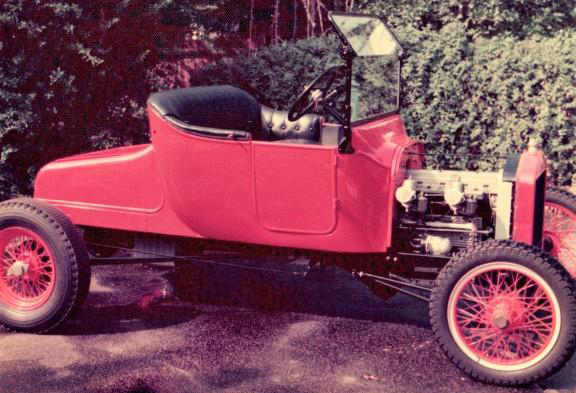 The car itself was a generally fairly stock steel body 1922 Roadster but included a dropped front axle and modified rear frame spring mount and perches to lower the car overall. Depending on the race year, Buffalo wire wheels and custom fabricated wire wheels were used depending on the changing rules of the Hill Climb. 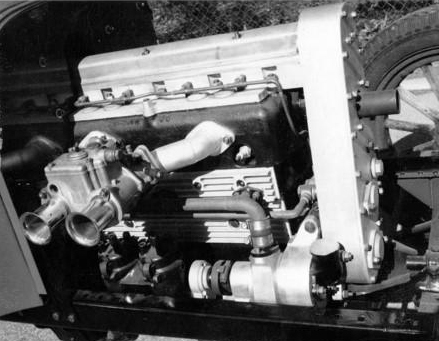 The Ford gas tank under the seat was replaced by a fabricated dual tank, one side for gas, the other side for oil storage as the engine was also a dry sump configuration. 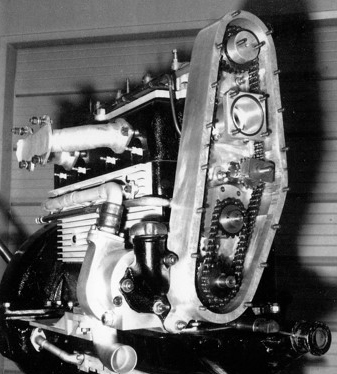 The standard T transmission had been isolated from the engine oil by a modern rear main seal (required by the dry sump design), and a steel flywheel was machined for the higher revs. The car ran a Ruckstell rear end with “Rocky Mountain” brakes. It was around late 1965 when the engine work was started and culminated with the restoration of the roadster in time for the 1969 Hill Climb. Ellis’ last competition was in 1975. Photo taken 1973-4. Now sporting a “Turtle deck” to complete the body plus SU carbs and yet another distributor change. at the starting line of the Hill Climb on the maiden voyage in ’69.